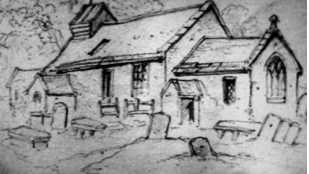 The earliest records of St. Stephen’s Church go back to the 12th Century. In 1830 the old church was reported as "ruinous and in decay and not capable of repair and is unfit for the purpose of celebrating Divine Service and Sermons therein" A faculty was obtained to build a new church to a design by Joseph Hansom. 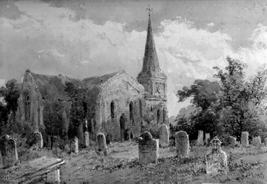 The present church was completed in 1832 but the old chancel remained. The chancel was rebuilt in 1851. Much of the old stone was used in rebuilding. The church is cruciform in shape with a nave, chancel and two transepts. It is built of Tadcaster limestone. with a porch, belltower and brooch spire at the west end. It has plastered walls inside. The church had galleries at the rear of the nave and in each transept. It could seat 338 people. The galleries in the transept were later removed. It had a flat ceiling at the level of the top of the walls. The church of 1832 has been added to and altered a number of times since then, the latest being after the fire at Christmas 1992. Originally there was a high pitched roof over the nave and the transepts. In 1951/2 it was replaced by the present roof and the transepts were both covered with the flat roofs. At that time the barrel vaulted ceiling was installed. Fortunately it was not destroyed by the fire. The steeple has had to be repaired on three occasions. On the last occasion in 1982 it was clad in a stone/ epoxy resin sheath. The weather vane is in the form of a fish. The church has a peel of six bells which were installed in 1954. They were removed from St. Mary, Bishophill Senior and are dated 1770. A steel frame had to be installed to support them. They are used by bell ringers from far and wide. The small font which stood at the west door was replaced with the present larger font in the middle of the aisle in 1881. It was presented by Edward and Augusta Helme. It had its plinth removed in 1993 to give more room at each side. In 1893 the marble pulpit was installed in memory of Rachel Walton. In 1889 a vestry was built on the outside between the north transept and the chancel over the family vault of Col. William Hale who was a great benefactor. The entrance porch was donated by Mr. and Mrs William Lee in 1971 to celebrate their golden wedding. ​The gallery used to have access from the bell ringing chamber. It had sloping seating and housed the organ. The gallery was altered in 1994, after the fire, to form two meeting rooms with a glass panelled front. Access is by a new stairway coming from the porch and it is encased in a glass screen. In early days music in the church was by string instruments played in the gallery. A small organ dated 1889 used to be situated in the south transept. A larger two manual pipe organ, built by Harrison of Durham in 1914 was built into the gallery in 1951. It came from St. Saviour's church in York in 1951. Unfortunately this organ was destroyed in the fire. A computer organ by Wood of Bradford has been installed in the north transept with loudspeakers hidden behind false pipes over the south door. The chancel has undergone a number of changes. It used to have the Lord's prayer and The Ten Commandments on the east wall. In 1914 a carved oak reredos was erected in its place. In 1984 this was moved forwards to the top of the steps into the sanctuary in order to make a store room and clergy vestry. The clergy stalls and altar rail were brought forwards of the chancel arch. Since the fire of 1992 the first level has been extended forwards into the body of the church and the transepts. The altar rails have been extended round it. The reredos was destroyed by the fire. A kitchen and toilet were built onto the north west corner of the church in1988. There are many fine memorials in the church. Those on the east walls of the transepts were removed into the chancel in 1993. The church was built in the reign of King William IV and his coat of arms is portrayed in the inner porch. The church has a wealth of stained glass. The oldest, above the vestry door, is by Edmund Gyles. It bears the coat of arms of King Charles II dated 1662 and has emblems with half rose and half thistle surmounted by a crown. The north transept has Victorian glass in memory of the Hale family inserted at the turn of the century. They depict biblical scenes. The fine window over the north door depicts Christ administering the sacrament. The window in the south transept shows Mary the mother of Jesus at the cross. It is in memory of Elizabeth Cautley, 1893. On the south wall of the chancel is a pair of windows showing The Adoration of The Magi and The Nativity, in memory of A.H.Russell. The Magi window is an exact reproduction after the 1992 fire. The east window originally had the coat of arms of four Yorkshire families and the Gyles window which is now over the vestry door. In 1890 it was replaced by a fine window with scenes from the life of Christ (The Annunciation, The Nativity, The Last Supper, the Crucifixion and the Ascension) A copy of it hangs besides the west door. It was completely destroyed by the fire. A beautiful modern window, the work of Henry Haigh is its replacement. The kneelers in the pews and a round the altar rail are the work of ladies of the parish after the fire. The designs are mainly taken from emblems found within the church. The high altar is in memory of Rev. R.P.T.Tennent vicar from 1879 to 1931. A list of incumbents from 1313 hangs besides the south door. The church is very much alive. People of all ages and backgrounds gather here Sunday by Sunday to praise God and learn about the Lord Jesus Christ.